A fence does not hold the workpiece down so however many fences are being used at least one clamp is still going to be needed to hold the workpiece down. Furthermore a fence may stop rotation in one direction but when milling it is not always predictable which way the workpiece might rotate. This means that the minimum required is going to be one clamp and one fence. A fence can be so short it is simply a small square in which case it just needs one hole in it. But it can be much longer. In this case it needs two or more holes to clamp it. 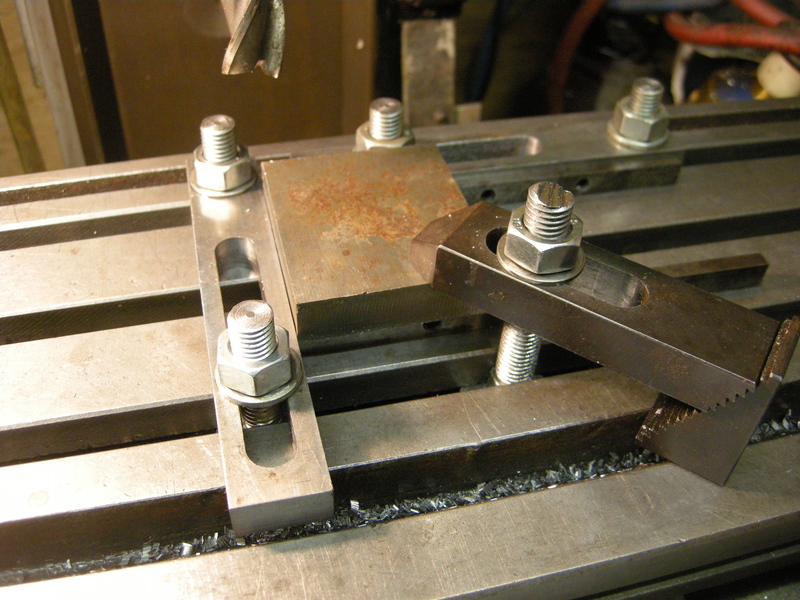 It is useful if one of the holes is a long slot so the fence can be bolted to the milling table at an angle. A fence like this can do almost anything. When it is at right angles to the table it can be positioned anywhere. 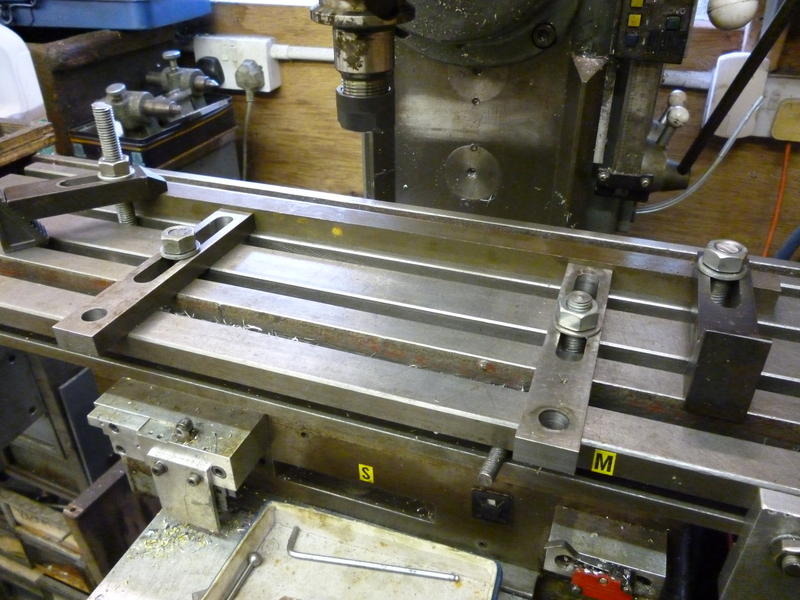 But if it is fitted parallel to the milling table it cannot move to any position – it has to fit a T-slot. However two of these with slots can be equivalent to one that can be positioned anywhere and parallel to the table. These two fences are holding the workpiece with just their ends. Used this way round they can define a position anywhere across the milling table. A perfectly good fence can be much thinner than an equally good clamp. 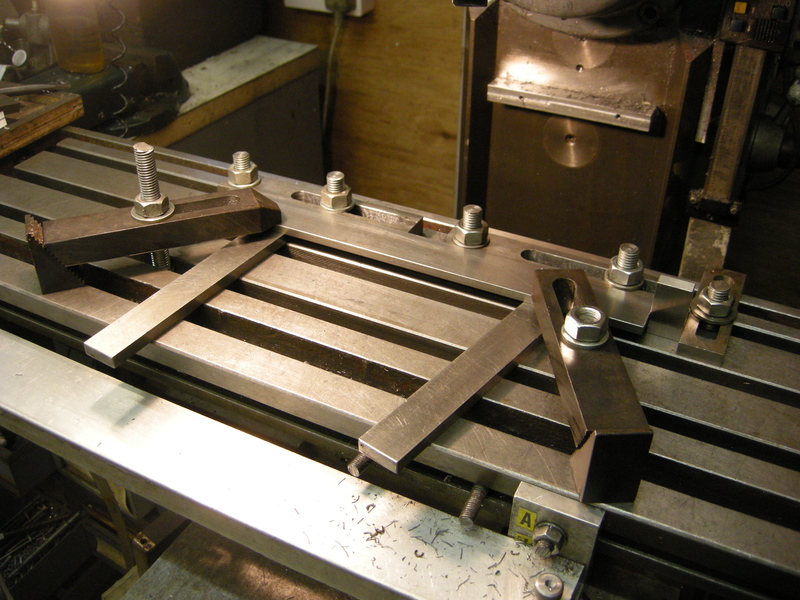 Ordinary clamps can be used as fences except that the bolts needed for a fence only ever need to be just long enough to bolt the fence to the milling table. This can be useful when horizontal milling when there can be a shortage of height. An advantage of making separate fences is that they can be set-up with bolts etc and will always e ready to use. It is easy to see that from the face of the T-nut, through the side of the T-slop, through the fence, through the washer, to the nut on top is solid metal. Consequently the fence can be tightened to any practical amount without any risk of damaging the table. Fences might often be square but they can also be round, i.e., disk shaped. If two round fences are clamped to the table so that a straight edge touching them is parallel to the table then a straight edge touching them can be moved to and fro and will still be parallel to the table. Very often, when milling thin sheet, it is necessary to raise the sheet up on parallels. 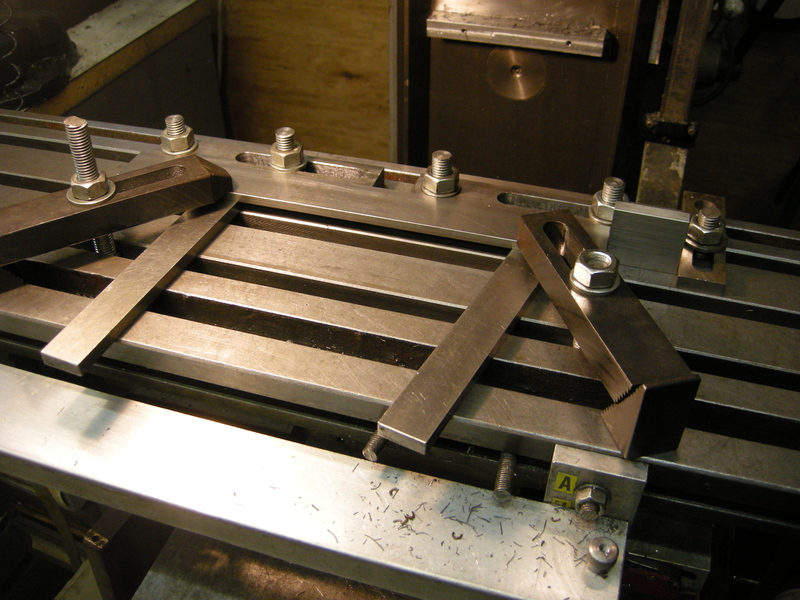 But it is also necessary to line one edge of the sheet up relative to the milling table. It is not possible to put a square against the edge because it is raised up. One solution is to put a thick parallel between the edge and the square. Alternatively it is possible to use a thick fence that it set square but because it is thick the workpiece can be aligned against it even though it is on parallels. It is possible to have a fence parallel to the milling table that is always ready for use. In this case it uses the slot along the front of the milling table. If the cut needed is longer than the travel of the table then it can be useful to clamp a very long fence, or more short ones, along the x-axis of the table and parallel to it. The workpiece is then clamped against this. After the first cut has been made the workpiece is moved along and then clamped again against the fence. It is essential that these fences are as parallel as possible with the movement of the table in the x direction. On very long workpieces, very slight errors in alignment become very obvious if there is the slightest error in the setting of the workpiece. Similarly, dings on the workpiece or the fences can cause serious inaccuracies. Where the amount of movement of the workpiece is important it is possible to use a short fence to set the position of an edge of the workpiece along the x-axis. It is then possible to move the workpiece by a set amount simply by putting a stack of slip gauges between this short fence and the edge of the workpiece. In the above figure, the workpiece is resting on two parallels that are sticking out in the y direction. 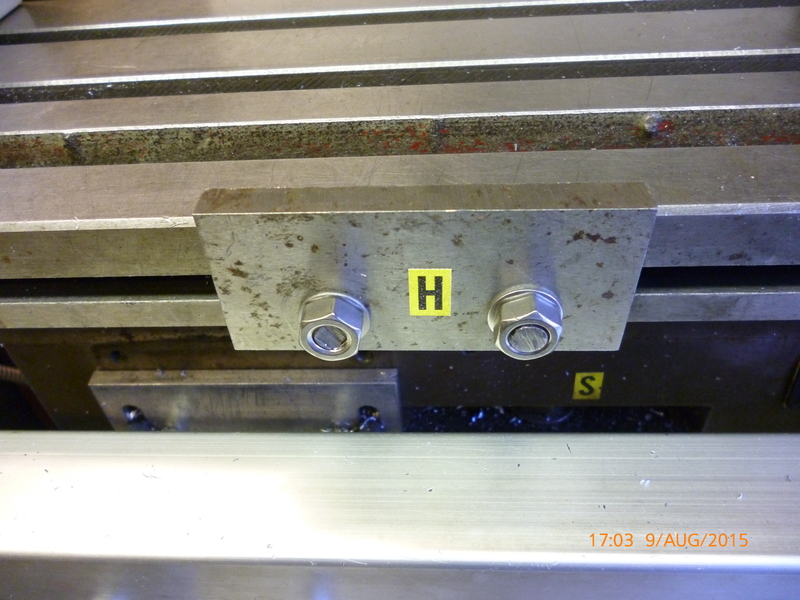 The fences are clamped to a T-slot just behind the workpiece. 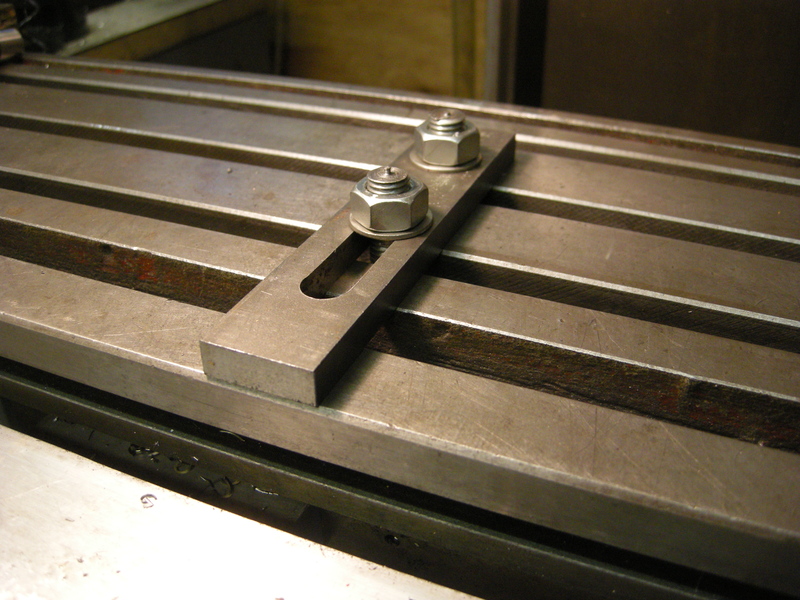 This works in this case because the workpiece has one long, straight edge. A series of fences can perform the function of a fixture if they can stop the workpiece moving laterally in any direction and from rotating. Only one clamp is then needed to hold the workpiece in place. It might seem the more fences used the better. However if there is some slight variation in the sizes of the workpieces held by this series of fences then each time a new workpiece is fitted it will fit in a slightly different position. Surprisingly, what is needed is the smallest number necessary to hold the workpiece so it can only be held in one position. For example, a workpiece with two edges at right angles can be held by two fences at right angles. 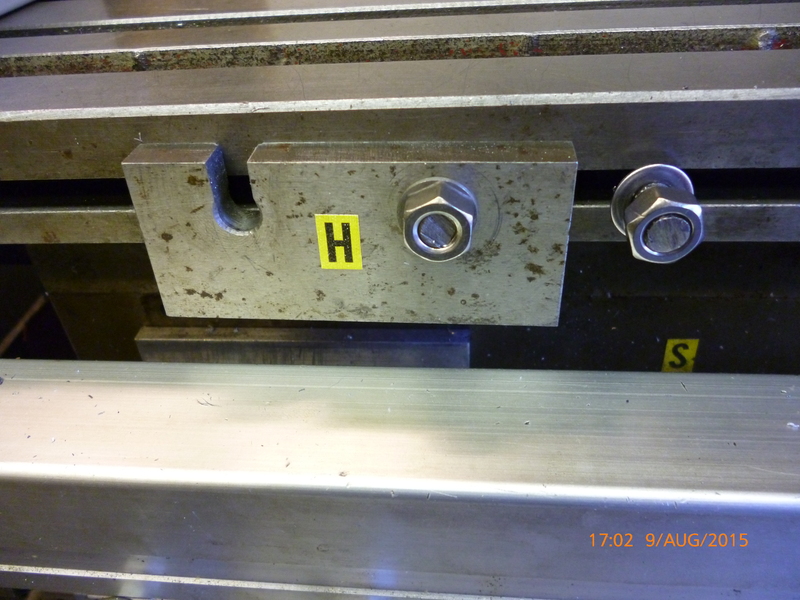 All measurements for cuts or holes on these workpieces can be from these two edges. Finding bolts, nut and washers and fitting them to the fence takes time. A lot of time can be saved if fences are permanently set up with their own bolts etc. Fences used on the table always need bolts of a fixed length. So they can be set up with the shortest bolt necessary. This has the added advantage that it minimises the risk of the bolt sticking up unnecessarily and clashing with the arbor when in the horizontal mode.